Mother’s Day is fast approaching, so it is time to think about the perfect gift to get your mom this year. Yes, there are the typical staples: a card and some flowers. But you could also surprise her this year with a homemade gift! 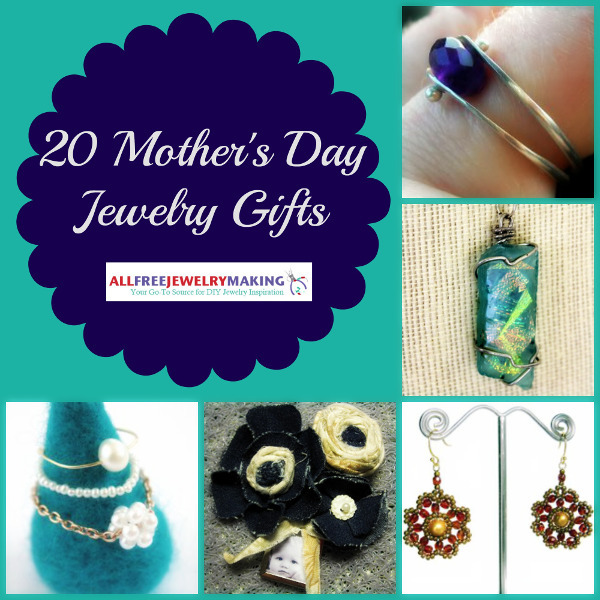 You can make gorgeous handcrafted jewelry for mom with this wonderful collection of Mother’s Day jewelry gifts from AllFreeJewelryMaking. Whether your mother’s jewelry style is more haute chic, trendy, or classically beautiful, we have a series of homemade Mother’s Day gifts that will delight and astound her! From beaded bracelets to pretty brooches, make your mother feel glamorous with these unique handmade gift ideas that incorporate all of your creativity and design finesse to create the perfect special something for her. This Glass Photo Pendant is such a thoughtful way to show your appreciation for her. 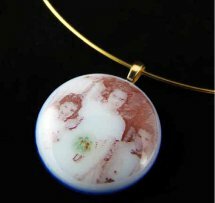 Immortalize your mother’s favorite family photos or a new moment with this technique for transferring photographs onto a gorgeous glass pendant. For more necklace patterns for gifts, visit our collection page. You’ll never see your mom’s wrist bare again after you present her with one of these lovely handmade beaded bracelets. 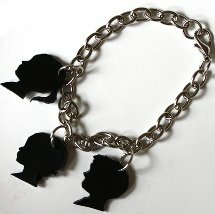 Charming DIY jewelry gifts, like this Silhouette Charm Bracelets are sure to become Mom’s new favorite. Look at our collection for more beaded bracelet gift ideas. Moms are often so busy that they don’t have time to go out and buy things for themselves. 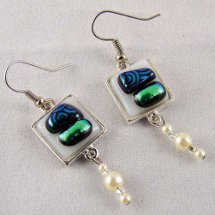 Pamper your mom with a pair of pretty beaded earrings that you made yourself! Find the tutorial for these Bedazzled Glass Earrings and more in this collection. This Crystal Volcano Ring is the ultimate in modern costume jewelry. 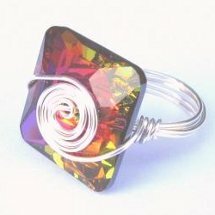 A whimsical swirl of wire complements this Swarovski crystal that catches the light like fireworks and flame. Make your mother a cocktail queen with this snazzy accent piece. Go to our collection page to find even more DIY rings to give as gifts. 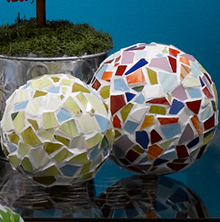 BONUS: Looking for a project you can use as a pendant, bracelet accent, or standalone piece? 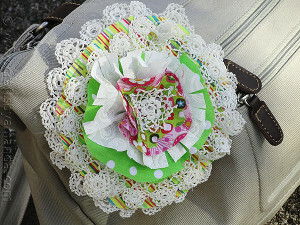 Try out this Mother’s Day Fabric Brooch! 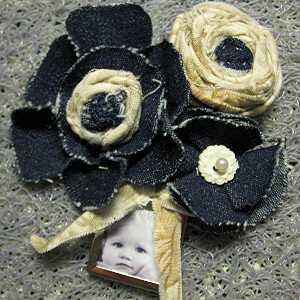 Use fabric flowers and a photo charm to craft the perfect Mother’s Day gift with this personalized brooch. 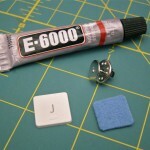 If you love this DIY brooch, then be sure to check AllFreeJewelryMaking.com for the latest holiday jewelry tutorials! 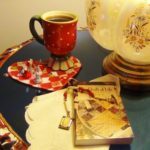 Plus, if you need even more Mother’s Day jewelry project ideas, be sure to check out our free eBook, Mother’s Day Jewelry Gifts: 8 Free Jewelry Making Tutorials. 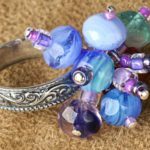 We hope that Mother’s Day Jewelry Gifts: 8 Free Jewelry Making Tutorials will inspire you to create homemade Mother’s Day gifts from the heart this May! Whether your mother’s jewelry style is more haute chic, trendy, or classically beautiful, we have a series of homemade Mother’s Day gifts that will delight and astound her. No one loves you and cares for you quite like your mom, so be sure to celebrate with her! As summer vacation approaches, parents and kids alike are busier than ever, so Mother’s Day celebrations tend to be brushed aside. Fortunately, AllFreeHolidayCrafts.com, FaveCrafts.com and our brand new upcoming site, AllFreeKidsCrafts.com, includes a fantastic collection of gifts kids can make for mom on her special day. 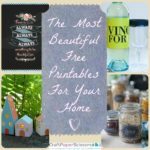 I’ve collected the best of the best from AllFreeKidsCrafts to inspire some quick crafty ideas for kids and parents to make together as a Mother’s Day celebration. 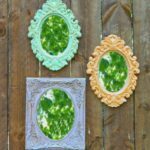 Dads, kids, friends and family members can get together to celebrate the special ladies in their lives with these gorgeous kids craft ideas. 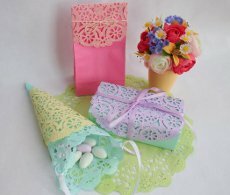 If you’re looking for more Mother’s Day crafts kids can make, check out the great projects on AllFreeHolidayCrafts.com and FaveCrafts.com. 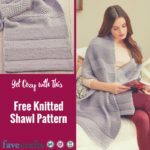 Also, be sure to check back to AllFreeKidsCrafts.com regularly to see what awesome new projects we’ve added for kids and their favorite grownups to make together! Crepe Paper Flowers are lovely and dainty yellow flowers that Mom will love in a vase to accompany a special breakfast in bed. Dads and family members can have kids make special Envelope Gift Bags so that they can put more Mother’s Day gift ideas inside! Older kids can whip up some Chunky Pearl Necklaces to accompany mom’s wardrobe in no time! Fresh flowers might fade, but this Duct Tape Flower Bouquet will never wilt. 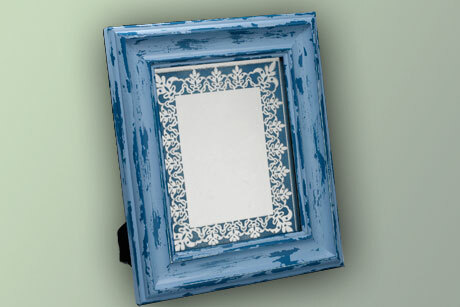 Revamp an old picture frame into a Framed Earring Holder where Mom can keep all of her favorite jewelry! This Satin Beaded Necklace features wooden beads painted with the faces of her favorite little ones. 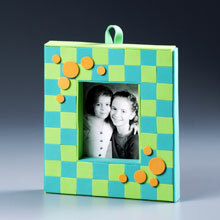 I think this Mom’s Photo Cube from FaveCrafts is simply precious and would make a wonderful Mother’s Day gift. These Blooming Bottle Cap Magnets from AllFreeHolidayCrafts are such cute adornments for the fridge! 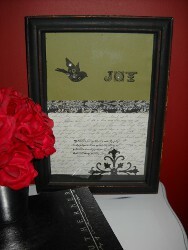 Hand Embroidered Cards are easy for kids to design and make for moms, grandmothers, aunts, and other special ladies. A Fabric Rosette Bouquet makes a positively gorgeous centerpiece and decorative kids crafts that Mom can use to complement her décor. If the special ladies like to sew, kids can make No Sew Cupcake Pincushions for their crafty moms. Any clay crafts for kids make wonderful, heartfelt gifts for moms, but this Ceramic Face Planter can be personalized to look like mom or their own darling little faces. To all of the moms out there, Happy Mother’s Day! What is the best gift you’ve ever received from your kids? 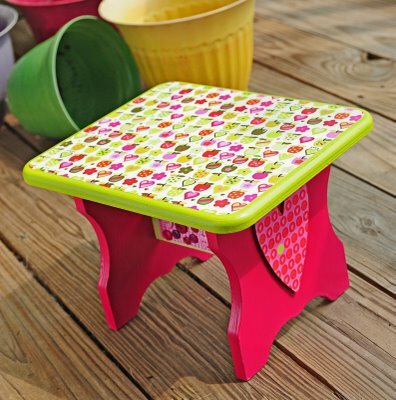 Don’t forget to check back regularly to AllFreeKidsCrafts.com to see what fun new projects we’ve added! Mother’s Day is right around the corner and you’re probably trying to figure out the perfect gift for that special lady in your life, whether it’s your Mom, grandmother, aunt, teacher, or just a close friend. No matter what you end up getting her, here’s an idea to make your gift that much more special: a unique, handmade gift box to wrap your present in! 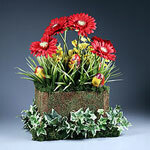 Imagine the smile on her face when she sees this beautiful decorative gift box, made especially for her! The best part about this DIY gift box is that it’s really simple to put together, especially when you follow the step-by-step instructions from our craft designer, Carlene Eshelman. 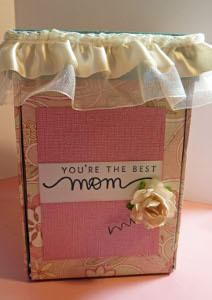 In the two video tutorials below, she’ll show you how to take scrapbook paper, pieces of chipboard and some decorative accents and put them together to create a lovely storage container that’s perfect for holding small gifts like bath soaps, shower gels, lotions, and anything else you might get Mom to pamper herself with! 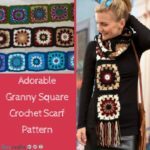 Just follow along with Carlene in the video tutorials below to see how it’s done! If you liked this video tutorial, be sure to subscribe to the AllFreeHolidayCrafts YouTube channel so you don’t miss any more great ideas! We update the channel every week with craft video tutorials so there’s always something new to check out! Any time you’re stumped for holiday craft inspiration, just come and watch our holiday craft playlists and we promise you’ll walk away with some great new ideas to try! What are YOU making for Mother’s Day this year? 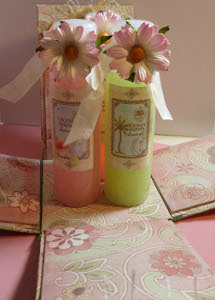 Monthly Craft Question: Did You Craft for Mother’s Day? Mother’s Day is over, but that doesn’t mean we can’t enjoy what we crafted for one another. 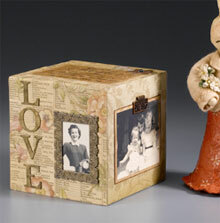 For April, the monthly craft question was: What are you giving mom for Mother’s day this year? Did you buy it or craft it? If you crafted it, what did you make? As usual, we reached out to designers and crafters alike to see what crafty things they were cooking up in their craft rooms. You know, I got my mom a set of knitting needles so that she could start crafting for herself. I gave the set to her already (she’s not a patient person 🙂 and she’s already made me a scarf! Each pin reflects their personal taste and colors they tend to wear. Oh my… this year they are all store bought! My mom passed away five years ago so I can’t give her anything physical, but I can send good thoughts to heaven, and remember the good that was in her … such as the things I mention in her eulogy here. My mother-in-law, however, is still alive. So at the request of my husband, I am making her one of my signature “Recycled Bird Flower Pots” so she can store her watercolor paintbrushes. She just started learning how to pain this year and she’s doing great. We want to send her something that says, “You go girl! We’re so proud of you.” while still giving something of ourselves…which is important since we live in different states. Create your own Recycled Bird Flower Pots here! I will be giving Mom a batch of homemade sugar cookies in a creative “upcycled” container and some whimsical Modern Surrealist Jewelry! This year for Mother’s Day my sister and I are hosting a fancy tea at my house with a handful of mothers to celebrate.I’m fortunate to live close to my sister, mom and grandmother, so Mother’s day is always a great get together. 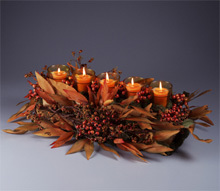 We are making all the food, treats and table settings instead of a specific gift to take home. I will, however be making a variety of accessories such as a stand to display our finger sandwiches and a tablecloth with name cards. I am making my gift this year. My mother is an avid gardener and I will be making her a Gardener’s Hand Scrub! The ingredients are simple: granulated sugar and a moisturizing hand soap mixed into a paste. Add a drop or two of peppermint or almond extract and scoop into a jar. 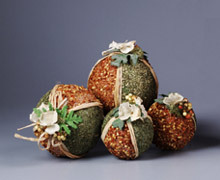 Decorate with twine and you are good to go! I made my mom a pincushion threadcatcher for her sewing machine. It’s an oldie but a goodie and I’m a sucker for useful, clever crafts. I also bought her some new glass head pins to go with it. Check out how to make your own on her blog! want to make my mother something extra special! This guest post was written by Iris for My Baby Clothes Boutique. I have to admit, I am one of those sentimental moms who saves every little item that her child makes for her or used as a baby. It is so hard for me to throw away things that I might want to look back on when my son or daughter grows up. For example, I don’t want to get rid of some of my son’s baby toys, like the first plush football I used to teach him to catch when he was an infant and couldn’t even roll over. What if he becomes a pro football player and I want to pull out that first football he played with? Or what about the first drawing he scribbled for me as a toddler–what if he becomes a famous painter and I want to look at his first art piece? And I can’t get rid of his first pair of swimming goggles; some say he could be the next Michael Phelps! I can go on and on, but as the years go by and we collect more things, sometimes I have to just part with certain items that we don’t have room to store (like drawers full of my son’s craft projects from preschool). Artwork takes over our refrigerator and shelves fill up with projects that eventually fall apart. Thankfully my husband is very tidy and he is very good at helping me decide which items we should keep and which items I unfortunately have to part with. Well, Mother’s Day is right around the corner and my husband always has a difficult time deciding what kind of gift to give me. He always gives me a gift card from my favorite store (yes, I absolutely love gift cards. I know some people don’t think gift cards are personal enough, but for a stay-at-home mom like me who is very budget-oriented, I am absolutely thrilled when I receive a gift card knowing that I don’t have to feel guilty spending the gift card on myself!). But since he also knows how sentimental I am, he also adds a homemade project to go alongside the gift card that always makes me so proud. This part of the gift is the part that is difficult for him. Because he knows I keep all of our children’s special projects, he doesn’t want to add another item to throw in the “craft drawer”. So last year, he finally came up with a gift that was made by our 4-year-old son, but also looked modern enough to match the style of our home and would stay on the shelf for display – forever! Yes, he was not going to make me throw this one away! 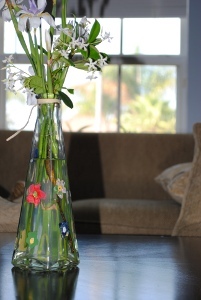 It was a simple glass flower vase, decorated with beautiful painted flower petals all around the vase. The best part is the fact that each of these beautiful flower petals were made by our son’s precious fingerprints. Our one-year-old unfortunately could not participate since she was not good enough to listen to Daddy’s instructions, although I know there is one little fingerprint on the vase that belongs to her. All it took was one glass vase and different colored enamel paints to create this project, and of course, very special fingers. You can use all kinds of glass to create a gift like this. 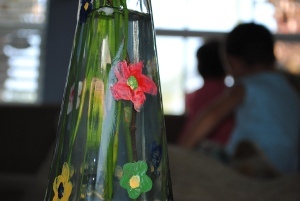 When my son’s preschool teacher came over for a play date and she saw the vase, it gave her an idea for the school art festival they were participating in. 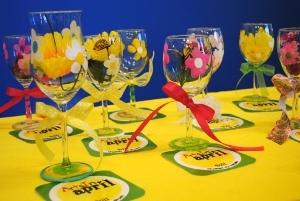 They used wine glasses instead of a vase and it made such a beautiful display for the art festival. You can use jars, bottles, the possibilities are endless, but one thing I know for sure, this is a gift that would make any mother proud and would gladly be displayed on a shelf for a lifetime. Many people who visit our house see my special vase and think that the artwork on the vase is professionally painted, and they are surprised to find out that it was my 4-year-old son who created it. See, I told you that my son could be a famous painter! Iris is a very crafty mom who likes to work on a budget. Her ideas are shared through her blog as well as with My Baby Clothes Boutique. Dress your babies in the best baby clothes, cutest tutus and most adorable baby headbands this summer! Everyone knows there’s no place like home. So why not make yours unique by creating your own decorations for your house? We’ve collected a bunch of projects to get you started. From simple crafts that offer tips for beginners to fun ideas for the holidays, these projects will make you want to deck out your whole house in handmade creations! 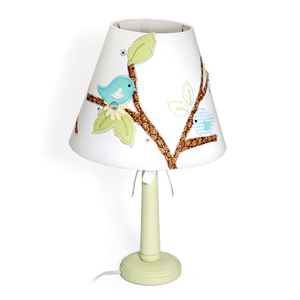 Which home decor craft in your house do you get the most compliments on? Kids are adorable especially when they’re trying to make cute crafts for fun holidays. 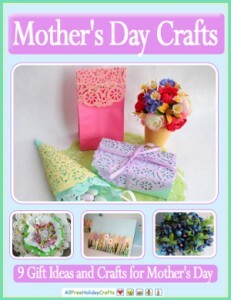 Mother’s day is on it’s way which means all the kids are looking for that perfect craft for their favorite Mommy. There’s nothing sweeter than getting a homemade craft from a young child. You can cherish those forever. Making crafts for Mother’s day doesn’t just have to be for Mom, it can be for Grandma, sister, aunt or even just a friend. 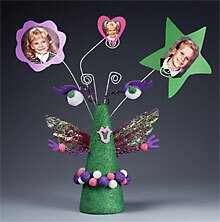 Here are some fun crafts for kids to make on Mom’s Day. 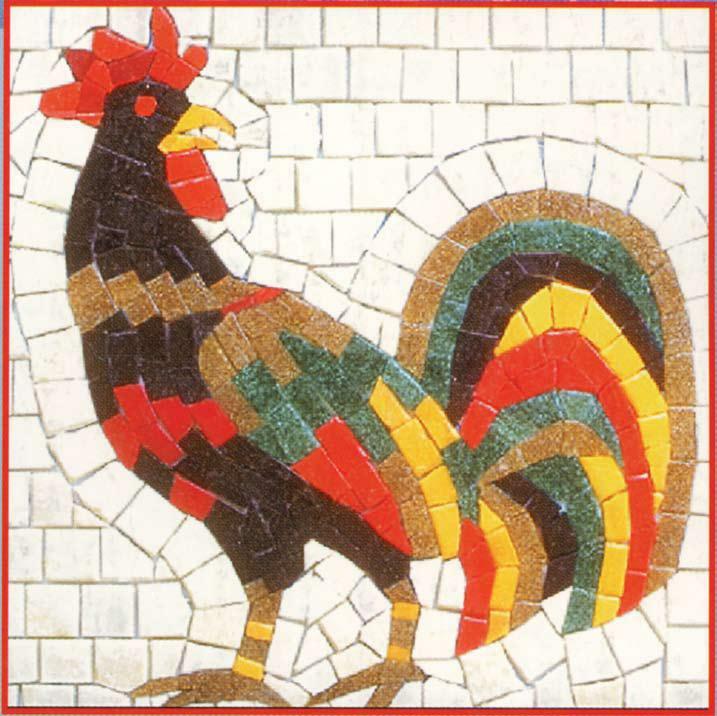 Mosaic Mod Frame– The foam base and self-stick foam shapes are fun and easy to work with. Out of this World Photo Holder– This is a quick and easy project for kids to put together. Mom will love it! 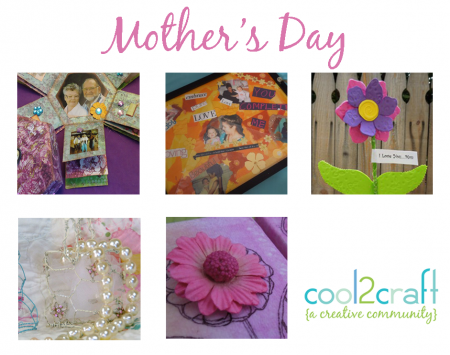 Click for more exciting Mother’s Day craft projects! Individually, we define Mothers Day for ourselves: our one breakfast in bed all year; a day at the park with our kids; a gathering of the generations in our family to break bread together. 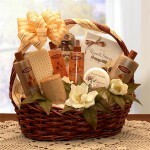 Commercially, Mothers Day is continually defined for us as the purchase of greeting cards, hearts, flowers, and candies. But so many of us are unaware of the history of Mothers Day, the real meaning and empowerment of women that fueled the creation of this day. For me personally, I used to love Mothers Day. It was one of those holidays where I crafted goodies for the women in my life: hand-painted flower pots with a packet of seeds; hand-made cards expressing my thanks and appreciation; hand-beaded bling, especially sparkly. And when I was pregnant with my own son, I so looked forward to my own first Mothers Day. But after a full term, perfectly healthy pregnancy, my son died at birth. Mothers Day was nothing but rage for me then. It was amazing to me how grief and death work so hard to erase mothers like me. All the other moms are getting flowers at some public or religious event, but the childless moms are ignored. The physically present children are celebrated while everyone desperately tries to avoid eye contact with the bereaved mothers for fear they might want their children’s names said, too. Grief is treated as pathological instead of as a normal response to overwhelming loss. And so in silence, and sometimes starting to believe I was crazy, I began hating Mothers Day. I did everything I could to avoid it. I purposely spent the day making angry, morbid art, or shouting at the ocean, or breaking dishes with the intent of making mosaic from the broken pieces one day. Then something happened. In a little park on the little island on which we live, a group of mothers gathered for a parade and protest. As part of the festivities, they were celebrating their maternal feelings for ALL children of any race, nationality, religion, gender, alive or dead. In doing so, they were spreading the story and true meaning that started Mothers Day. Wait?! What!? I couldn’t believe I was hearing for the first time that Mothers Day is more than a made-up, greeting card company exercise in commercialism?! But there it was. In black and white. They were handing out fliers sharing the writing of Julia Ward Howe, first published in 1870 as a protest against the carnage and violence of the Civil War. This was a protest led by women whose sons had died! Bereaved mothers started this tradition of Mothers Day! In the beginning, this was a day of protest, an expression of horrified grief from bereaved mothers who were parted from their sons!! Wow. Okay. That’s a different spin. Say firmly: “We will not have great questions decided by irrelevant agencies. Our husbands shall not come to us, reeking with carnage, for caresses and applause. Our sons shall not be taken from us to unlearn all that we have been able to teach them of charity, mercy and patience. I’ll celebrate with you if you will first mourn with me. It is the combination of the two that lends itself to the true meaning of Mothers Day! So I encourage you, too, as you celebrate in your ways this coming weekend. If you are crafting goodies for the mothers at your gathering, please don’t forget the bereaved mums. If flowers are given to all the mums whose children are playing and laughing that day, please don’t ignore the mums whose children physically gone, but still loved. If you want to do more than just hearts and flowers, make your own meaning of this day. Sit with the women in your family and pour over the family tree. Find out if there were any children born, who died, who are now left off the family tree. Find out the full scope of motherhood for all the women in your family. Filling out your family tree completely, not only honors all the women who birthed children, but gives your children and generations to come, a view of their full family and medical histories. Mothers Day can include hearts and flowers, but it can also be as substantial and empowering as you want it to be! Kara LC Jones aka Mother Henna is the Grief & Creativity Coach behind the works at MotherHenna.com and co-founder of KOTA: Knowing Ourselves Thru Art, an expressive arts outreach for bereaved parents after the death of a child.